In recent years, Giving Tuesday has emerged as a counterbalance to the consumer based Black Friday, Small Business Saturday, and Cyber Monday shopping traditions. It serves as a reminder that the holiday season is about charitable acts of kindness and helping our neighbors in need. Giving Tuesday is an excellent opportunity for non-profits and charities to tell their communities about the work they do and encourage charitable giving to their organization. Smaller organizations or those that may be completely volunteer based shouldn’t feel incapable of participating — you don’t need a dedicated marketing team to take part in Giving Tuesday. Below are some simple ideas to try that don’t take a large budget or tons of advanced planning. At a minimum, your social media accounts should publish posts about Giving Tuesday (remember to use the hashtag #GivingTuesday to maximize your reach!). Post throughout the day or schedule your posts ahead of time with social media management software like Hootsuite, Buffer, or Sprout Social. Posts should include a call to action, i.e. do you want them to donate? Volunteer? Learn more about your work? Become an advocate? Depending on the call to action, include links to applicable web pages such as your volunteer opportunity or donation pages. Posts can focus on the work you do, success stories (shared either with client permission or written to remove identifying info), milestones and achievements, goals, and other information that you’d like your community to know about you. 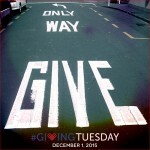 Examples of general Giving Tuesday social media posts can be found here. We’re always happy to help you boost your Giving Tuesday social media messages, so be sure to follow us on Twitter so we can follow you back to see your posts in our feed, then we can retweet your message to our followers. Images and video are more compelling than text-only posts, and most social media sites say that posts that include them get more views, so use them if you can. Your video doesn’t have to be Academy Award worthy — spontaneous and unrehearsed videos are authentic and give people a sense of who you are. 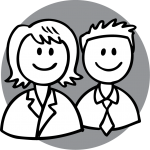 Try a quick interview with a colleague about what they do and why they love working for your agency. Or maybe do a fast tour around the office showing everyone hard at work. It can even be as simple as a 30 second video talking about the work of your agency. Videos should be short and sweet, as most research shows short videos are the most watched. After taking the video you can usually do some light editing or clipping right on your phone before posting it to social media. If you’re feeling brave you can even do a live video right from your Facebook or Twitter app on your phone. Hopefully your organization is lucky enough to have some supporters in the business community that work with you throughout the year by holding fundraisers or making donations. Giving Tuesday is another perfect opportunity to engage with your biggest fans. Perhaps they’d be willing to participate in a short video. Or maybe they’d do something as simple as keep a donation box or stack of your agency’s brochures at their register or other space in their business. Most businesses, especially those that already support your work, will welcome the opportunity to continue their advocacy during the holiday season. If your organization is open to the public then Giving Tuesday is a perfect time to invite people in so they can learn more about what you do and become a supporter. Let your reception staff know about Giving Tuesday and equip them with brochures and other materials to give out. Consider hanging a sign in your lobby or outside your building to encourage people to stop in and learn more about your work in celebration of Giving Tuesday. Don’t forget — the holiday season is a great time for recruiting volunteers, too, so make sure applications or volunteer information is on hand as well. Your website is one of your greatest assets, so make sure your Giving Tuesday participation is prominently featured somehow. This can be accomplished through something as simple as a blog post or homepage image, or more advanced like adding a new temporary widget to your site that directs website visitors to your donation page, volunteer application, etc. If when people call you they first hear a general message or listen to a menu routing them to their desired destination, consider temporarily altering your greeting in honor of Giving Tuesday. This can be as simple as a 10-15 second “hello” wishing them a happy holiday season and inviting them to support your work, along with an invitation to visit your website for more information. This won’t add much at all to their wait time but will get your message in front of everyone who calls you. Our next webinar is coming up on Wednesday, March 7th at 1pm EST. Traditional competency frameworks are very much based on employment and paid career opportunities. But what if these frameworks could be applied to volunteer work that could help volunteer coordinators, managers, and others identify the best potential volunteers for a position? That’s the topic that our presenters, Laura Mayer and Liz Barnes, will discuss in our webinar. They created a volunteer competency framework that helps identify and define a high performance volunteer, and refines the recruiting process to predict which candidates will perform successfully and stay with the agency for a long time. The framework helps take that “gut feeling” you may have about who will be a great volunteer during their interview, and put its into a measurable format. Ms. Mayer is the Program Director at PRS CrisisLink, a 24-hour crisis hotline, textline and telephone reassurance program serving northern Virginia and the District of Columbia. PRS CrisisLink is a program of Psychiatric Rehabilitation Services, Inc. and exists so that individuals living with mental illness, substance use disorders, mild intellectual disabilities, autism spectrum disorders, and anyone who faces life crises can achieve safety, personal wellness, recovery and community integration. Ms. Mayer is a graduate of George Mason University’s Community and Global Health program and has brought cost effective and evidence-based suicide prevention programming to the local community. In 2014, Ms. Mayer partnered with the local public mental health system to provide crisis texting to the Fairfax County Public School System and the surrounding communities. Ms. Mayer is a member of the National Suicide Prevention Lifeline Steering Committee, Suicide Prevention Alliance of Northern Virginia, the Fairfax County Youth Suicide Fatality Review Team and mental health promotion workgroups in several jurisdictions. Ms. Mayer is a certified Applied Suicide Intervention Skills Trainer, Suicide Survivor Support Group Facilitator and holds certifications in suicide risk assessment, domestic violence danger assessments and mental health first aid. She has been interviewed and featured by Comcast Newsmakers and NBC4’s Changing Minds Campaign. Ms. Liz Barnes is the Assistant Director, Plans and Policy at the Department of Defense Suicide Prevention Office. Her portfolio responsibilities include developing suicide prevention, intervention, and postvention policies, guidance, and strategic planning, as well as the Department of Defense lead for the Veterans/Military Crisis Line and BeThere Peer Support and Outreach Call Center. Ms. Barnes served in the United States Army for nine years in the Ordnance Corps and Adjutant General Corps and had a variety of assignments at the installation level, National Guard Bureau, and Army Staff. Since 2009, Ms. Barnes has worked in the Under Secretary of Defense for Personnel and Readiness in a variety of positions focusing on personnel policy, human resources, and congressional affairs. In 2012, Ms. Barnes was selected to assist in the integration efforts of the Department’s recommendations with the Military Compensation and Retirement Modernization Commission. Ms. Barnes is a Board member at Psychiatric Rehabilitation Services (PRS) Inc. and a volunteer hotline and textline crisis worker and core trainer at Psychiatric PRS CrisisLink, in northern Virginia. Ms. Barnes established and co-leads a suicide bereavement support group that fills a gap in services for suicide loss survivors ages 18-24 years old in the Washington Metropolitan area. Ms. Barnes is also an Applied Suicide Intervention Skills Training (ASIST) Trainer. Ms. Barnes holds a Bachelor’s Degree from McDaniel College in Sociology and a Master’s Degree from Georgetown University in Human Resources Management. Tomorrow is Giving Tuesday and we know many of you have some great campaigns in the works to generate awareness about your organization, which will hopefully result in donations as well. Giving Tuesday is a great opportunity to get the word out about your organization and get noticed during this season of charitable giving. We’re looking forward to reading all your great tweets sharing information about the valuable work of your organizations and wish you all lots of success generating interest, awareness, and monetary support for your agency! According to Larry C. Johnson’s Eight Principles of Sustainable Fundraising, few non-profit organizations see their donors as investors. Often times a non-profit will focus on events where donors get some kind of premium for their one-time donation. Johnson ask us to re-imagine this — to move from a transactional construct to one that is more relational. When we ask people to give, we are inviting them to partner with us, to share in our vision and support our mission and programmatic goals. Before any event we should be asking: Does the event fit in with our mission? Is it worth the time, volunteer and staff effort, and upfront costs? How will we continue to engage our donors afterward? Regardless of the event, be it outreach or fundraising focused, it’s helpful to have a donor management system in place beforehand, to capture data and continue engagement post-event. My center, the Idaho Suicide Prevention Hotline, has held multiple fundraising and outreach events — a concert with an out of town performer who’d played previous benefits for our local NAMI chapter; a semicolon tattoo event — almost 100 people got permanent ink of henna tattoos that evening; hosting the film “The Mask You Live In”, a documentary about the risks of toxic masculinity, at our local art house theater; and a golf tournament this summer. We have learned that the best fundraisers are the ones with the lowest initial overhead and the least amount of logistical work! We have learned to not be too attached to dollar amounts, but to see these events first and foremost as outreach and volunteer engagement/recruitment opportunities. The concert required the most work and capital outlay, and we just broke even financially. We saw it as an overall success as the press surrounding the event did a lot to raise awareness of our service, and bring more prospective volunteers through our doors. The tattoo and film fundraisers were fairly easy to stage, cost relatively little up front and raised decent money between them. Finally, our golf fundraiser was hosted and staged by a person who had lost a family member to suicide some years prior and approached us with the offer. We also held an outreach event at a local arts festival where we created “listening stations” (booths with hard wired phones inside and out). One trained volunteer inside each booth played a caller with a thought provoking but non-suicidal/ on-super acute crisis story to tell. We asked participants to pick up the phone and simply listen, while our volunteers, in role, shared their stories. The volunteer then thanked the participant for listening. With the exception of the concert, our goal with each of these events is to have them be, if possible, “The First Annual…” which lowers the logistical bar for us for next year, and starts to build culture, community and history around each event, both within our shop and in our larger community. Get creative! Ask your volunteers, staff, and local community members for ideas that fit with your mission! Most of all, have fun with it. Treat your volunteers, staff, and participants well, make the most of community engagement opportunities presented, and keep up the dialogue with all of your new and existing partners/ investors! If you are considering a semicolon tattoo event, keep in mind that an organization called Project Semicolon has trademarked some of the associated imagery and verbiage. We reached out to them and got permission in writing before moving forward with the event. Guest blogger John Reusser is Director of the Idaho Suicide Prevention Hotline, and serves on the Board of Directors for CONTACT USA. John is also a member of the Idaho Council on Suicide Prevention, a board member of the Livewilder Foundation, and Certified ASIST (Applied Suicide Intervention Skills Training) Trainer and a licensed Designated Examiner. When it comes to training our helpline volunteers we all seek the same result: success. How we achieve that success varies amongst centers. How can you improve your training while balancing the needs and limitations of your agency? Here are some key factors to consider when creating or transforming your training. Volunteer selection is an important part of the process in order to determine if a prospective volunteer can be an effective crisis interventionist and is the right fit for your agency. Volunteer selection can be done individually or in a group setting. Identify the appropriate person/s to provide this, such as staff and/or current volunteers. Just because someone wants to volunteer on a crisis line, doesn’t always mean that they should. Protecting your agency, those we serve and the volunteer are all critical pieces to keep in mind. Identify individuals you feel believe in and can carry out your mission, possess the qualities and skills you find important and are trainable. Choosing the right facilitator/s to provide the training is important. The facilitator/s should preferably have experience in crisis intervention, teaching, a strong knowledge of the material and familiarity with how the crisis room operates. You may want to consider offering opportunities to current volunteers to co-facilitate sessions. How long should training be? The duration of your training should reflect the amount of time needed to properly teach and prepare individuals. It may be tempting or more convenient to provide a shorter training, but that may not always be in your best interest. There are advantages to offering shorter and longer trainings. 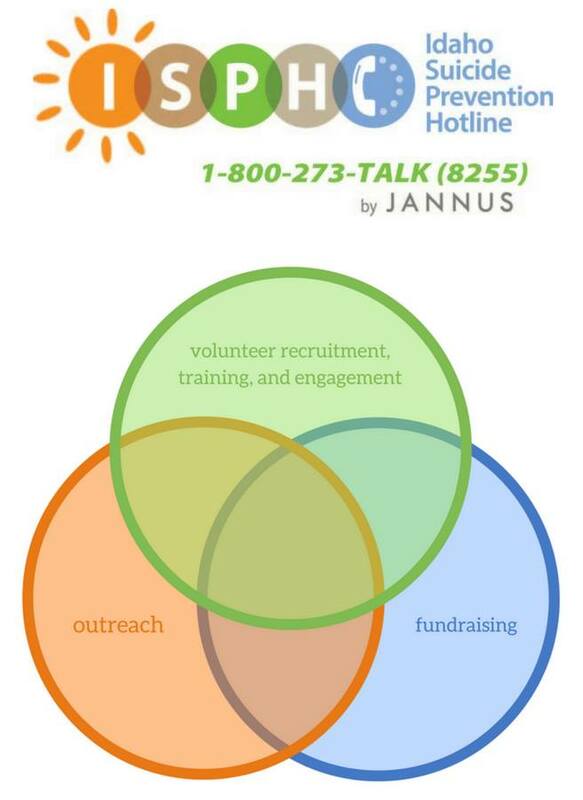 Shorter trainings may attract more volunteers because it is less of a time investment and they produce volunteers that are ready to take calls sooner. Longer trainings can provide more time to teach and develop volunteers and give you the opportunity to get to know each of them better. Invest the time; you are only as good as your training. Give thought to the amount of time between trainings, to give your volunteers and instructor time to process what has been taught and keep them rejuvenated. Allowing a few days between training classes can be beneficial. As you are scheduling your training keep the calendar in mind, you may want to avoid scheduling your training too close to any holidays. Remember to cater to different learning styles and don’t be afraid to experiment. More agencies are offering courses on line, which can be convenient but may exclude those that are not computer savvy. However, don’t forget to offer some traditional courses in person because human contact is invaluable. Asking volunteers to practice using their own past resolved crises instead of made up scenarios can be really beneficial. It offers them the opportunity to bond with the other trainees, see firsthand how the crisis intervention works and most importantly, demonstrates how hard it can be to be vulnerable and how brave our callers are to share their stories with us. Once the volunteers complete the training, don’t forget to honor them with a graduation celebration. Certificates, awards, cake and small gifts are some nice ways to honor the graduates. You may also want to consider hosting a graduation party that includes crisis line workers and other agency staff, including the CEO. ‘Tis the season! From bell ringers at store entrances to Toys for Tots and other collection boxes popping up everywhere you look, December is arguably the best time of year for campaigns geared at giving. The spirit of generosity is all around, and more practically speaking many want to make that last tax-deductible donation before the year is over. For several years now, Giving Tuesday has kicked things off. Occurring the Tuesday after Thanksgiving, it’s a day where our social media feeds are filled with compelling reasons to give to your favorite organization, typically accompanied by direct links to give online, then share your good deed with your friends. There are some awesome tips to enhance your Giving Tuesday plan available via Network for Good. For starters, check out some advice from non-profit fundraising pros and also a great guide to help you boost your social media posts on Giving Tuesday. Wishing you all great success with your Giving Tuesday campaigns!